Thug cop stomps on Paul O’Neal’s dead body after shooting him in the back killing him. 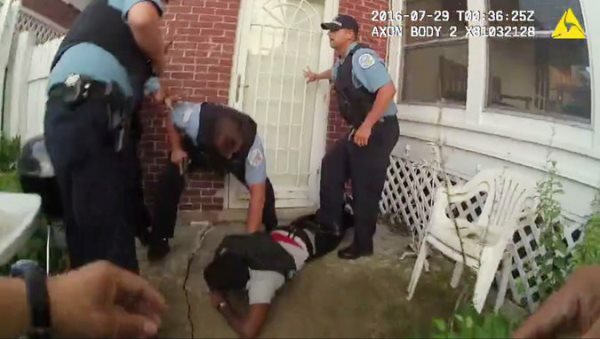 AFRICANGLOBE – Many Americans believe it is common for police officers to fire their guns. About three-in-ten adults estimate that police fire their weapons a few times a year while on duty, and more than eight-in-ten (83%) estimate that the typical officer has fired his or her service weapon at least once in their careers, outside of firearms training or on a gun range, according to a recent Pew Research Center national survey. Second, it is important to bear in mind that the factors that are associated with firing a duty weapon cannot necessarily be said to have caused officers to discharge their gun. For example, while the study shows that officers working in larger communities are more likely than those in smaller communities to have fired their weapon sometime in their law enforcement careers, the data don’t allow one to say that working in a large city or county is the reason – or even a reason – why officers are disproportionately likely to have fired their guns. Other factors common to both gun use while on duty and working in a large city may be the real cause.